Code optimization is about making programs run faster. In this article, I'll give some basic ideas how to do it. This article is NOT about optimization problems. It is also not about compression. Neither is it about churn rates (making users / companies happy). There is a ton of different ways how to speed up things. You can use algorithms and data structures that scale better. You can avoid some operations completely, because you actually don't use the results. Caching is also a technique that quite often helps to avoid repeating costly operations. In some cases it is completely fine to have computationally intensive parts, but you want to pre-compute them. So maybe you can just change the point in time when the costly operation is done. You should know how your code scales. When you write a data structure, you should document the Big-O notation of its operations. When you write functions, you should do the same. So much about nice an innocent thoughts. In reality, you probably get distracted or simply have more important things to do than noting the runtime complexity of your code. It's clear anyway, right? The truth is between those extremes. You should always look for potential scalability issues. In contrast to programming challenges, you have only a vague idea about the size of the inputs. Then rather assume an order of magnitude too much than too little. And think about in which direction you have to scale: More calls or calls with bigger arguments? Measuring performance has two aspects: Profiling the overall program to find which parts most time is spend on and then improving that part. For profiling in Python, I use cProfile. For improving I compare solutions via timeit. You might wonder for two solutions which one is the faster one. While this can be incredible hard to answer for arbitary hardware, even for your machine with roughly the same load it is a tough question. You need to execute the stuff multiple times, have the same setup (to make sure that the same stuff is cached) and then look at the measured results. Besides the fact that two make a list-lookups and the other two make set lookups, it might be hard to tell how much of a difference that makes. So I took a big text file for comparison and used timeit. As different runs have different times, I counted a couple of them and created Box plots to show the distribution of execution times. I also made sure that the algorithm is correct (never forget that when you optimize code!). Performance comparison of 4 algorithms. 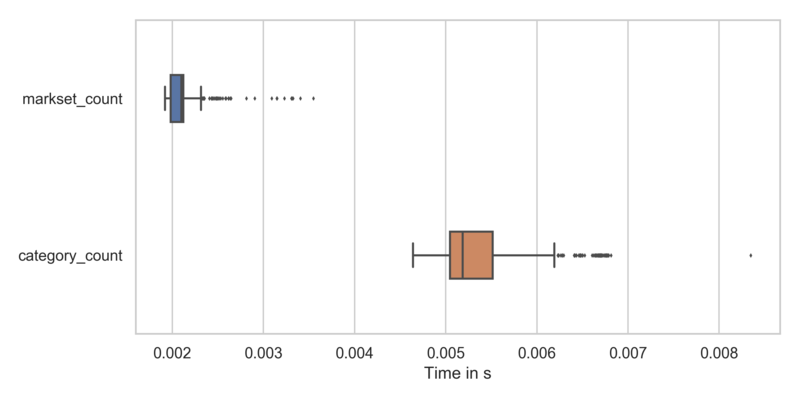 The filled part of the four box-plots shows where 50% of the data is. The line in the middle of the filled part is the median. You can clearly see that the markset_count and the category_count are way faster than the generator_count and the loop_count. Also the speed of the latter two varies way more. 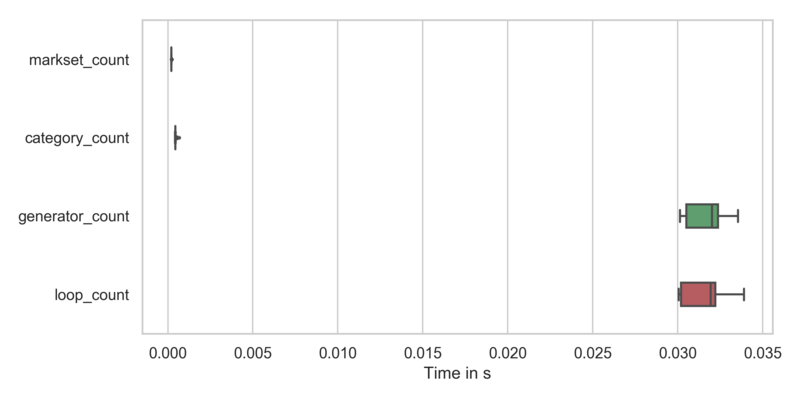 Interestingly, the generator_count is slower than the loop_count. Performance comparison of markset_count and category_count.